The triglycerides present in our body can be acquired through feeding or produced by our own organism through the liver. Triglycerides are important because they serve as an energy reserve for times of prolonged fasting or insufficient diet. When there is an excess of triglycerides circulating in the blood, we call hypertriglyceridemia. What causes growth of triglycerides? 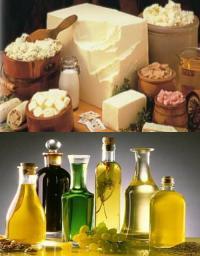 Triglycerides are the most common form of fat in our body, being used to provide energy to the body. When the amount of triglycerides is high, they are stored in the fat tissues (fatty tissues) in case they are needed in the future. When you develop those fats by the body, such as the hips or belly, you are actually storing the triglycerides that are in excess. Triglycerides are present in several common foods in our diet, but most are usually made by our liver. When we eat excess carbohydrates (sweets, pasta, breads, etc. ), the liver picks up these sugars and turns them into triglycerides, so they can be stored in adipose tissue, serving as an energy reserve. Triglycerides travel through the bloodstream coupled to a protein called VLDL, a lipoprotein similar to HDL and LDL that carries cholesterol through the blood. As we will see later, excess triglycerides in the blood are associated with deposition of fats in the vessels and atherosclerosis, increasing the risk of cardiovascular disease. Normal - below 150 mg/dL. Moderate - between 150 and 199 mg/dL. High - between 200 and 499 mg/dL. Very high - greater than or equal to 500 mg/dL. Triglyceride levels can rise for a number of reasons. Some people have genetic alterations that predispose to hypertriglyceridemia, others develop hypertriglyceridemia due to a hypercaloric diet or the presence of certain diseases. The increase in triglycerides may or may not be accompanied by changes in cholesterol. The two most common situations are high triglycerides and LDL (bad cholesterol) or high triglycerides and low HDL (good cholesterol). The elevation of triglycerides alone without cholesterol changes is not very common. There are some forms of familial hypertriglyceridemia, which are changes of genetic origin, which cause the patient to produce excess triglycerides, regardless of their diet. In these cases it is possible for the patient to present severe levels of triglycerides, sometimes above 1000 mg/dL. The food list above is far from complete. Any food rich in carbohydrates and/or saturated fats can cause an increase in triglycerides. Later, in the treatment part of hypertriglyceridemia, we will give some tips on the diet to lower triglycerides. As a rule, hypertriglyceridemia causes no symptoms. It is impossible to know if your triglycerides are high or low without blood tests. Patients with familial forms of hypertriglyceridemia, usually with triglyceride values chronically above 500 mg/dL, may present xanthomas, which are subcutaneous deposits of cholesterol in the form of nodules or yellowish plaques, which often occur in the palms around the eyes , in the feet or in the joints. Although the relationship between high triglycerides and cardiovascular risk has been questioned in the past, with current studies it has become clear that patients with hypertriglyceridemia are at a higher risk of developing cardiovascular disease, particularly coronary heart disease. It remains unclear, however, whether this association is caused directly by high triglycerides or other factors associated with hypertriglyceridemia, such as obesity, diabetes and elevated LDL cholesterol levels and low HDL cholesterol levels. Elevated triglycerides are also associated with increased fat deposition in the liver, causing a change known as hepatic steatosis. When the triglyceride values are above 1000 mg/dL, the patient may present with acute pancreatitis. The main goal of treating hypertriglyceridemia is to reduce the risk of cardiovascular disease. It is not yet known whether simple reduction of triglyceride values is sufficient to obtain these results. Therefore, the management of hypertriglyceridemia should always include treatment modalities that are known to be beneficial for patients with a high cardiovascular risk, such as a balanced diet, physical exercise, weight loss, diabetes control and control of LDL and HDL cholesterol. Regarding diet, as mentioned previously in this text, patients with hypertriglyceridemia should avoid foods rich in carbohydrates and fats. Give preference to foods rich in fiber, fish and foods rich in unsaturated fat and low in saturated fats. Choose breads, biscuits and cereals that contain oats, whole grains, barley, corn, rice or wheat as the first ingredient. Give preference to brown rice and whole wheat pasta. In beverages, avoid alcohol and prefer diet sodas. The milk should be skimmed. When we think about lowering LDL cholesterol the most important thing is to avoid fatty foods. When we think about lowering triglycerides, limiting the consumption of carbohydrates and calories is the most effective. In patients with triglycerides above 200 mg/dL, treatment with medicinal products should be considered. Importantly, the use of medications to control hypertriglyceridemia in no way excludes the patient's need to change lifestyle habits. If there is no dietary control, weight loss, diabetes control and increased exercise load, the benefit of pharmacological treatment will fall far short of what is desired. If in addition to hypertriglyceridemia the patient also has high cholesterol levels, the use of statins, such as simvastatin, pravastatin, rosuvastatin or atorvastatin may be helpful. These drugs act more under cholesterol, but also have some effect on triglyceride levels. Fibrates (Gemfibrozil or Fenofibrate) are more specific drugs to reduce triglyceride levels, and can achieve reductions of up to 70% in some cases. These drugs, however, do not act on cholesterol values. If there is a need to associate a statin with a fibrate, Fenofibrate should be the drug of choice because it presents fewer risks of drug interaction. Supplements rich in fish oil (omega 3) are also effective in reducing hypertriglyceridemia. To be effective, doses should be elevated above 3 grams per day of eicosapentaenoic acid / docosahexaenoic acid (EPA/DHA), which means at least 4 capsules per day. Some patients do not tolerate very high doses of peach oil, presenting diarrhea and abdominal cramps.